I know what you’re thinking, “Big deal, there are people around the pool,” but Saturday night around the pool was deceptively calm. If someone asked me to sum up the Saturday experience at TFW, I could do it in two words: absolute insanity. Truckers back in the day may have described the scene as “wall to wall and treetop tall” and they would have been right. Horror fans packed into the Sheraton Grand to see their favorites: Robert Englund, Sid Haig, Sean Patrick Flannery, Norman Reedus, Malcolm McDowell, Doug Bradley and many more. The zombie walk – hosted by Moxley Manor – kicked things off this morning and while the undead shambled in, hearses filled the parking lot for the annual hearse show. However, for a night owl like me, morning came a lot later in the day so, when not writing, I spent time trolling the vendor hall. Oh, the things I heard. Chris (Sean Bridger) and Belle (Angela Bettis) and their "perfect" life before "The Woman". In the beginning, as some people like to say, god created… well pretty much everything. But, it was kinda like throwing a party and nobody showing up, so god created guests: it solved the immediate problem and saved him on the cost of invitations. It wasn’t too long, though, before there was drama. God created man first and then pulled woman from an extra body part: so they were created together but not equally. Man was to be the boss of the woman. And while woman sought knowledge, man, by proxy for god, found that to be evil. They were cast out of paradise and woman was made to bear the burdens for her transgressions. At least that’s what some people say. Some people might say that man, in his natural state, prefers the balance found in a matriarchal belief system. Others still might say that man was created as a result of biological happenstance and natural selection. One thing that could be agreed upon is that Lucky McKee’s “the Woman” is a potent movie. Checked into the Sheraton Grand this afternoon. TWF attendees were trickling in as those attending a business conference were checking out. This evening, though, the excitement isn’t taking place at the hotel but at the Studio Movie Grill in Lewisville where Lucky McKee is getting the red carpet treatment for his controversial latest film, “The Woman”. It premiered at Sundance where it angered some members of the audience who felt it was too disturbing. Tonight, TFW goers will experience how disturbing McGee’s vision for ourselves. 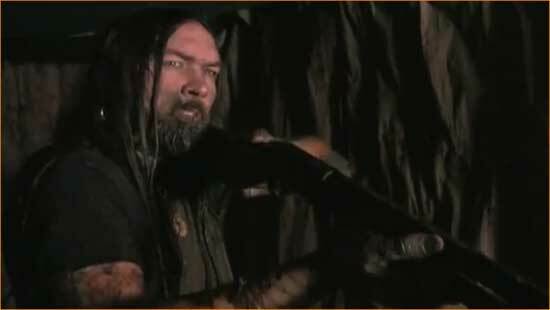 Screening before “The Woman” is “Offspring”, Andrew van den Houte’s 2009 offering about a clan of cannibals eating through a small community. 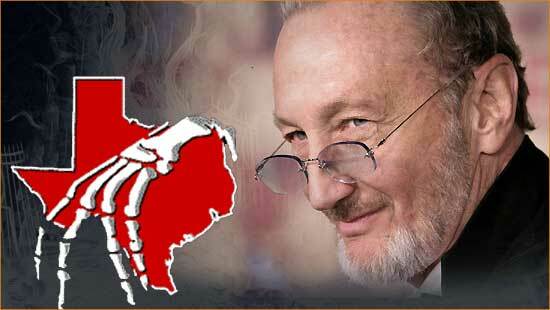 In addition to being a genre legend, Texas Frightmare Weekend guest Robert Englund is a man of irrepressible energy and took time out from his schedule to sit down with us to talk about coming back to Dallas, rednecks and just what exactly he tweets about. David (Jayson Champion) tries to survive his last case in "Kodie". Not long ago, if you wanted to make a movie and show it in theaters, you needed to have a wheelbarrow full of money. Lacking that, the chances of your movie ever seeing the light of day were between slim and none. However, with the maturation of DSLR camera technology, almost anyone can become a filmmaker. I love the fact that technology has taken something that used to only be the only in the hands of a select few and has opened the gates for everyone. Enter Abel Berry and his latest film, “Kodie”. Kristen (Amber Heard) just can't wash the crap smell off from "The Ward". In a perfect world, there is no crime, no disease. In a perfect world, we are at peace at the personal level, the global level and every level in between. In a perfect world, no good deed goes unrewarded, nice guys finish first and true love conquers all. In a perfect world, John Carpenter never makes a movie like “the Ward”.